L'ATHENE Pure Nutrient Skin Treatments help... to soften and lighten the look of old and new scars. Also minimizes redness and irritation. Soothes and calms skin. And maximally nourishes this skin that needs added support. Implement skincare as soon as possible, once your physician says you are ready for skincare. Scar tissue is not identical to the normal skin that it replaces. It is generally inferior in appearance and functional quality. Therefore, it needs more care to function normally. If the scar is on the face, begin a regime with L'ATHENE SR-3 Daily Skin Rejuvenation Kit. Starting on a regime of effective daily care is a great way to protect your skin. The SR-3 Skin Rejuvenation Starter Kit is a three-step kit to treat and protect skin in an effective, non-irritating way. First is cleansing the skin twice daily with a good non-detergent cleanser. Next, apply the nutrient serum, thin layer, to entire face and add an extra layer to the scarred area. Antioxidants can help improve the appearance of damaged skin and improve elasticity and tone. Next, follow with the moisturizer to hydrate and protect skin. Add sunscreen last. Apply NUTRIAGE Total Eye repair Creme - a powerful antioxidant-rich eye creme which boosts the antioxidant level around eyes to improve tone, softness and help correct lines and wrinkles. Also, this nutrient-rich eye creme can help reduce the redness of the scar following eye lid surgery (blepharoplasty). Below is a link to an example of healing results following an injury. This woman was burned when the hot wax from her home spa treatment splattered onto her face. For scars on the body, use a natural, non-detergent shampoo on your body and hair to avoid exposure of your skin to potentially irritating ingredients. After showering apply VITAPURE Ultra Antioxidant Nutrient Serum to body scarred area and follow with NEROLI Body Silkening Nutrient Crème. If scar has a scabbed area, after adding antioxidant serum, add a drop of EXTRACT Dry Skin Hydrating Plant Oil. Follow with NEROLI. Always cover with a sun block. In the presence of UV light, scarred skin can accumulate pigment and can become unsightly. 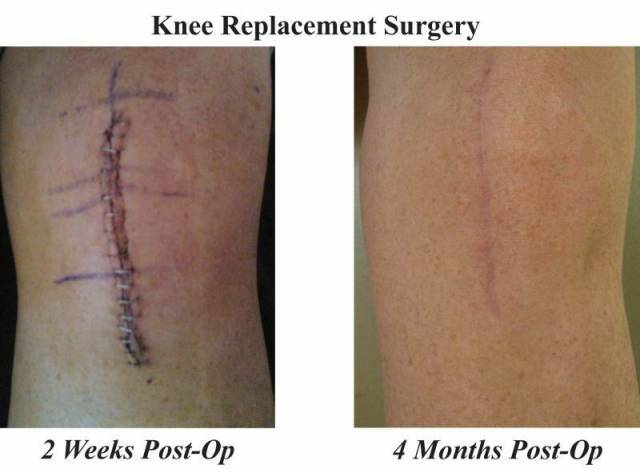 Below is a link to a surgical scar from a knee replacement. This woman used the L'ATHENE products on the incision line. L'ATHENE products are 99+% chemical-free and are very helpful to support 'injured' skin. These pure powerful products are formulated with the highest-quality nutrients that are nourishing, mild and non-irritating. They work in harmony WITH the body to TRULY nourish skin for the best health and best results in ALL ways for you! SR-3 Skin Rejuvenation Starter Kit is a great way to start for the face and NEROLI Body Silkening Nutrient Crème for the body. L'ATHENE products help to optimally support skin that has been altered. If scar has a scabbed area, after adding antioxidant serum, add a drop of EXTRACT Dry Skin Hydrating Plant Oil. Follow with NEROLI. For older scars that are sunken below the skin surface or raised above the surface, gentle exfoliation with MINERAL DERMA-SCRUB stimulates collagen re-building and helps to remove the dead surface cells. A routine of gentle exfoliation and good skin care for 90 days will help you to achieve your best result. If after this time, you desire more changes for your old scar, a physician may be able to recommend collagen injections or laser therapy as a solution. Keep using pure nutrient skin care during these secondary treatments. Scars are a result of the body's process of wound repair whether from injury or surgery. Therefore, scarring is a normal process in healing. L'ATHENE offers a complete natural skincare regimen to support scarred skin and to help promote skin health to achieve the most optimal aesthetic outcome. To reduce the look of scars, good skincare intervention can optimize the outcome. The earlier the intervention, the more ideal the results; however, the look of many old scars can be improved with antioxidant enriched products. Scars come in all shapes and sizes and in all elevations. Some can be raised, some can be sunken, some can become keloid and unsightly. On all types, implementing good skincare and good protection from the sun is important. With the advances in medicine, there are also many surgical revisions to scars that were not formerly available. Almost all skincare, including medical skincare brands, contain alcohols, petroleum-derivatives, detergents, and many other skin irritating ingredients, that can cause redness, inflammation or discomfort. This also includes many products that claim they are good for sensitive skin. Choosing skincare products that are free of chemicals and other irritants is important. Become a label reader. Read more about the ingredients in L'ATHENE products.